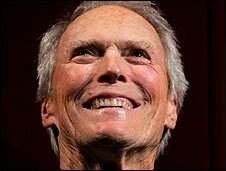 Movie icon Clint Eastwood will premiere his latest directorial outing, called Changeling, at the Cannes International Film Festival next month. The 1920s thriller, about a woman whose son is kidnapped, stars Angelina Jolie, John Malkovich and Amy Ryan. Other films set for the event include Wim Wenders' The Palermo Shooting and Steven Soderbergh's four-hour biopic of Cuban revolutionary Che Guevara. The latest Indiana Jones movie will also be shown out of competition. The 61st Cannes Film Festival runs from 14-25 May in the south of France. Quentin Tarantino will be among the Hollywood A-listers attending the festival, where he will give a film directing masterclass. Other celebrities rumoured to be attending include Penelope Cruz, Woody Allen, Benicio Del Toro and the main cast of Indiana Jones and the Kingdom of the Crystal Skull. Actor Sean Penn leads this year's jury, which also contains actress Natalie Portman and former Harry Potter director Alfonso Cuaron. Between them, they will decide the film which takes home the prestigious Palme d'Or prize. A total of 19 directors will compete for the honour, including Eastwood, Soderbergh and Wenders - as well as Brazil's Walter Salles, China's Jia Zhangke, Israeli Ari Folman, and Pablo Trapero of Argentina. Being John Malkovich screenwriter Charlie Kaufman is also in the running with his directorial debut Synecdoche, New York - which sees Philip Seymour Hoffman attempting to build a life-size model of the Big Apple. Last year's prize went to Romanian abortion drama 4 Months, 3 Weeks and 2 Days. No British films are competing for the Palme D'Or this year - but the UK Film Council said "people shouldn't get too hung up" about the selection. "Ultimately it comes down to what films are ready in time - plus different trends and tastes for what is essentially an auteur film festival," it said in a statement. Some British films will be seen in other sections of the festival, including Thomas Clay's Soi Cowboy and Terence Davies' Of Time And The City, which was filmed in Liverpool. Outside the competition, Woody Allen will screen his latest romance, Vicky Cristina Barcelona, which stars Oscar-winning Spanish stars Penelope Cruz and Javier Bardem. Kung Fu Panda, an animated comedy from Dreamworks with a voice cast boasting Jack Black, Angelina Jolie, Lucy Liu and Dustin Hoffman, will also premiere on Cannes' famous Croisette. The festival is the most prestigious event in the film calendar after the Oscars, and attracts more than 33,000 people to France each year. The 2008 festival features fewer big-name directors than in previous years. Organisers announcing the line-up in Paris said many of the event's favourite film-makers are currently working on new movies.